The End of Academic Library Circulation? 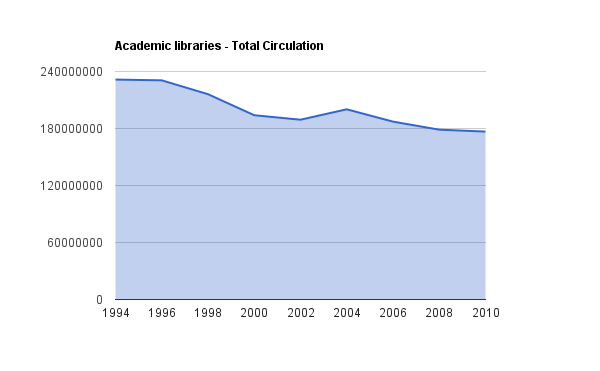 This chart shows total circulation for academic libraries, and while there’s a decline it certainly doesn’t look like it will hit zero anytime soon, definitely not in just 8 years. But there is a problem with this data and this perspective on library statistics. When we talk about “total circulation” we’re talking about a property of the library, we’re not really thinking about users. 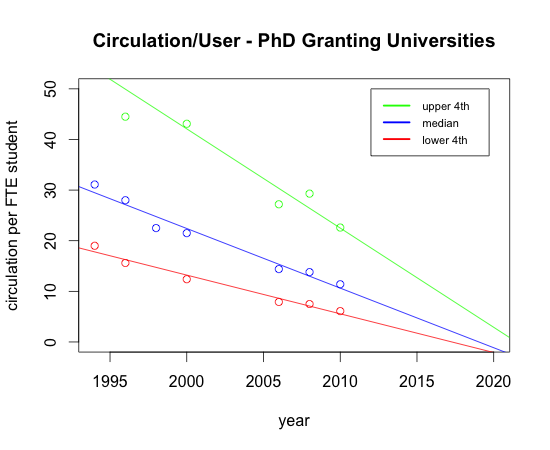 This chart shows the upper/lower quartiles and median for circulation per FTE student. 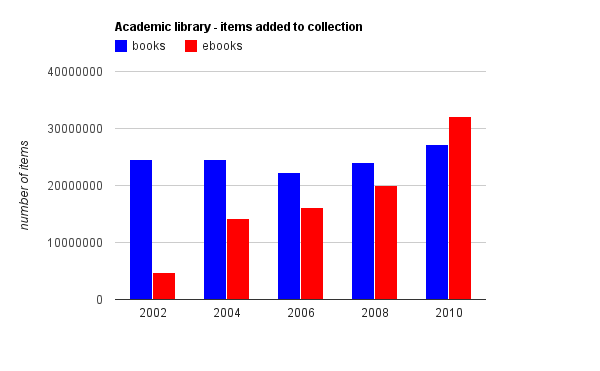 As you can see this data shows a much more dramatic drop in the circulation of library materials. Rising student populations hide this fact. But 2020? Can I be serious? 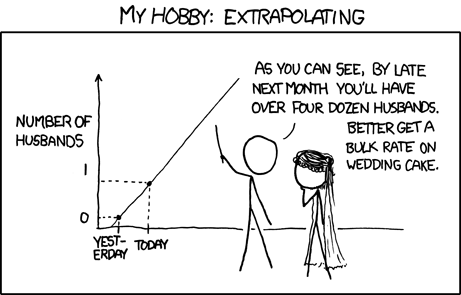 The simple linear regression model in the charts is probably a good predictor of 2012, but not necessarily 2020. Hitting zero without flattening out seems pretty unlikely. 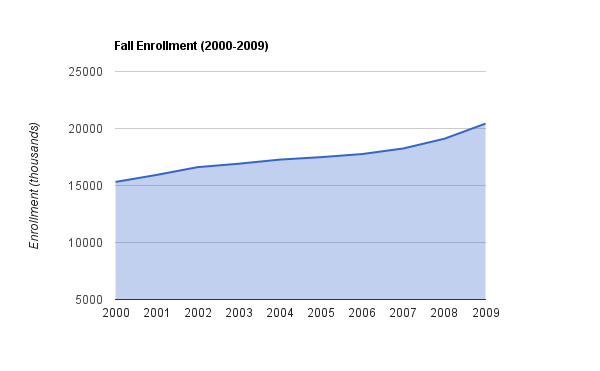 However, it is worth noting the circulation per user in the lower quartile for less than 4 year colleges reached 1.1 in 2010. If you’re averaging around 1 item per user, every user that takes out 2 items means there’s another who has checked out 0. By far the number one hypothesis I get when I show people this data is “Clearly this is just because of the rise of e-journals and e-books”. This hypothesis is reasonable: What has happened is simply that users have switched from print to electronic. This data represents a shift in media, nothing more. But there are 2 very large problems with this hypothesis. First, print journal circulation is not universal among academic libraries. In the cases where there is no print journal circulation the effect of e-journals would not be present in circulation data. However, I don’t have information to point out exactly how many academic libraries did circulate print journals. Maybe the effect of e-journals on just the libraries that do circulate serials could effect the data for everyone. The data we have already shown resolves this issue. Libraries that did circulate serials would have higher circulation per user than those that did not. By showing different quartiles we can address this discrepancy in the data between libraries that did and did not circulate journals. If you look at the data you’ll see that indeed the upper quartile does seem to have a higher rate of decline, but not enough to validate this hypothesis. The median and lower quartiles also experience this shift, so something else must be at work. Ebooks, of course, do have an effect on usage, but they’re not the primary factor in this change. So clearly we must reject the hypothesis that this is merely a media shift. Certainly the shift from print to electronic has had some effect, but it is not the sole cause. If it’s not a shift in media, the most reasonable explanation is that it’s a shift in user behavior. Students are simply not using books (in any format) as much as they used to. What is Causing this Shift in User Behavior? The next question is what is the cause of this shift. I think the most simple answer is the web. 1996 is the first data point showing a drop in circulation. Of course the web was quite small then, but AOL and Yahoo! were already around, and the Internet Archive had been founded. If you think back to a pre-web time, pretty much anything you needed to know more about required a trip to the library and checking out a book. The most important thing to take away is that, regardless of cause, user behavior has changed and by all data points is still changing. In the end, the greatest question is how will academic libraries adapt? It is clear that the answer is not as simple as a transition to a new media. To survive, librarians must find the answer before we have enough data to prove these predictions. If you enjoyed exploring this data please check out Library Data and follow @librarydata on twitter. As well as a reflection of student activity, I think this drop in circulation might be a reflection of assignments. When I was a GTA teaching First Year Composition, we worked hard to choose timely topics. This was true in the assignments we gave, but it was also true when trying to find examples to use in class discussion. So I might choose a topic like multitasking, since that’s something that a lot of students do, for good or ill. Are there books that would have information on this topic? Not sure. Is it discussed in journals, on paper or on screen? Yes, I expect, but some of those journal articles may be too advanced/academic for a FYC classroom. We’re more likely to find and use articles online. So it isn’t necessarily the case that students are turning to online resources on their own. If I’m asking them to find current research that refutes the articles I brought that argue that multitasking isn’t efficient, they need new sources. This is just one field, in one class, but it might be true for others too. I believe that another factor may be an increase in students who complete research in situ so to speak. Off campus housing has risen. Hauling books in a backpack is less attractive than xeroxing what you need and nesting for a day or more at a table in the library. Have you seem much empty space in the library lately? In house use may contribute to the trend. I think it’s true that scholarly discussion in many fields has shifted away from books. Many disciplines simply move too fast for books to keep up, library science is one. That discourse has shifted to the web: blogs, web resources, articles. But many fields especially in the humanities still rely on books as the primer form of scholarly expression. While I don’t think we have hit book using bottom, I’m not sure it will ever reach zero. Perhaps new online forms of interactive books are the future of the format? This isn’t necessarily a problem but should be a major factor in space planning. I am really disappointed when these kind of analyses don’t take into account the lowering of rigour in university classes. Any number of books have come out in the last five years examining the shift to vocationalism, the lowering of academic standards, and the reduction in class preparation hours required to achieve those lowered standards. The interested might want to start with Lowering Higher Education: The Rise of Corporate Universities and the Fall of Liberal Education by James Cote and Anton L. Allahar. I myself, filling in gaps in preparation for a second masters, am taking a junior level history course. The assignments are all based around a single book. The instructor (not a professor, another issue) has indicated that we are not to do any outside research. This might seem like an extreme case, but I am sure it represents a trend. Overworked, underpaid sessional instructors who live and die based on student evaluations. Technology has a place, but perhaps the reason why students can get by on glimpses of snippets from Google Books is because we are not requiring extensive research to solve difficult assignments. Another factor may be students narrowing down which books they need before checking them out, rather than checking out a pile of books on spec. I noticed this change in my own research style as I gained access to previews, tables of contents, and more subject headings from the internet (especially Google Books) and richer modern library catalogues. The implication that online journal use is only displacing the circulation of their concurrent print editions is – at least in my institution – somewhat naïve. Certainly, that would explain part of the situation (although in our library periodicals circulate only to faculty), but I think the more pervasive trend here is one of ease of access. That’s not to say that our print collections are difficult to access, but if it’s a question of choosing between trekking 0.5-0.75 miles to the library during the dead of Winter, or staying in your heated dorm room and looking up the secondary sources that were cited in the book you would have used anyway, it’s understandable that use of the volume in question would decline. Couple that with many professors’ increasing demands for student to use journals, newspapers, and non-traditional sources, and it’s no surprise that print circulation has declined. In the battle for a student’s effort, JStor from his/her room is going to trump walking to the library to pick up a book. One of the significant points this misses is the silliness of relying on print circulation as a measure of success when the bulk of the academic library efforts over the last 20 years or so has been to move away from print as the sole source of information. Surely in this day and age of new metrics and technologies there are more useful ways to assess value.